The report covers an examination of all the industries in global market, which make use of the whipping agents and the demand of products that includes whipping agents. To get a clear insight of the market, various macro-economic factors have been also taken into consideration, such as rise in disposable income, retail sales of the products, etc. When it comes to the overall food ingredient industry, the evolving tastes and preferences of consumers are not lost on manufacturers, as offerings have been broadened to accommodate organic and natural food products. Many established players are focusing in acquiring smaller companies which have the expertise and reputation of being pros in specific organic and natural domains. These smaller companies have deep brad loyalty, and owing to the small scale of production, it is much easier for them to come up with innovative products. These factors, combined with increasing emphasis on organic and natural, are likely to make smaller companies attractive targets for mergers and acquisitions. Whipping agents have been witnessing an exponential increase in the demand due to rising applications in bakery industry. Growing demand for high overrun, high foam stability, short whipping time, and pleasant milky taste will continue to fuel the consumption of whipping agents for making baked goods. 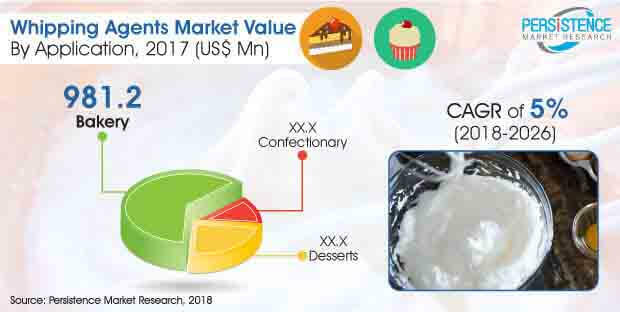 As whipping agents comprise proteins, fats, and emulsifiers, the demand in aerated food products such as mousse, instant puddings, sorbets, sherbets, desserts, baked goods, and other applications is expected to escalate in near future. The major application areas of whipping agents are identified in bakery, confectionary, and desserts. Among these, bakery is anticipated to hold the highest market value of over US$ 981 Mn by the end of 2026. Applications in desserts are foreseen to proliferate at a CAGR of 5.2% during the forecast period. Emerging regional markets are presumed to hold significant growth potential especially in baked goods, wherein consumer preference for packaged goods is expanding rapidly, owing to the influence of the Western culture, changing lifestyles, and increasing acceptance of flavored and convenience food products. Leading whipping agent manufacturers are thus focusing on targeting companies in bakery industry to increase their market share by introducing innovative whipping agents to be used in sponge cakes, pound cakes, donuts, muffins, and many more products, to improve product quality and shelf life. Whipping agents have been recently popularized as an alternative of egg white. Various confectionery products are developed by using egg white foam, such as chocolate-coated marshmallows and nougat. However, the production process associated with egg white poses various difficulties, such as heat and acid sensitivity, animal origin, and allergic potential. Moreover, the price fluctuation of eggs is another factor which may ultimately affect the price of the final product. Several companies are developing innovative products that can reduce the requirement of egg white foam in making aerated food products. Whipping agents is one such innovation that can help in replacing the use of egg white, which is foreseen to gain escalated traction in near future. Moreover, the demand for whipping agents will witness sustained growth, with increasing production of palm oil and growing consumption of ice-cream worldwide. Whipping cream with higher fat content helps in maintaining its shape in desserts or pastries for a longer time. Moreover, it is stiffer than the low-fat cream, which makes it an ideal ingredient for a majority bakeries and restaurants. However, variability of the fat content of the whipping cream available in may continue to hamper the growth of global whipping agents market. The research reports also showcases low penetration of whipping agents in developing regions. Companies in developing economies tend to prefer the use of emulsifiers or stabilizers over whipped cream, in baked products and ice creams. Regional growth of the whipped cream market is thus expected to be relatively poor in Asia Pacific and Middle Eastern regions.